Interesting, I had a feeling that they were expecting Bloodborne/Dark Souls sales WW, but they're expecting it to sell 300k/350k in Japan? They better not release it near DS3's release date, otherwise they won't meet that target. Ninja Gaiden never did well in Japan anyway, I hope they succeed though because the game looks good. They don't say how much they expect it to sell, they just said that its PS4 exclusive its because the audience for Ni Oh is already/migrating there. I have no idea what those two Vita games on 20 and 15 points are. Yeah, they didn't say that, but I think that's what they're expecting if they want to sell their game to the Bloodborne/Dark Souls demographic. They wouldn't mention those games if they didn't expect similar sales, they want to chase that demographic. Yesterday at Bic Camera Shinjuku, there was an event with this cutie walking around. I see no Main Craft on this list, the king has finally fallen! Another PS3/Vita > PS4 release? Also MGSV is falling quickly. Edit: Also didn't notice Destiny, lol. Isn't that kind of bad for Revelations 2? Or were there other retail releases before? Also, why does Splatoon have comgnet points on the Tsutaya chart lol. World Trigger should sell around the same as other low/mid-tier manga adaptions by Namco Bandai. Well yes, Revelations 2 came out on PS3 and PS4 in March. I doubt there are many RE fans that own a Vita but don't own a PS3, most who wanted to play the game already did, its not as if the console versions weren't cheap by now. 500k For SO5 in Japan? Wonder if it's close to stabilizing again. There were other SKUs before, iirc. Haha, maybe TATSUYA would do well embracing a point system chart. The 500k thing was more a wish from the SE staff rather than a target expectation. Also, I wouldn't call a crazy hold when week 39 is Silver Week. 11/26 - Taiko no Tatsujin: Atsumete Tomodachi Daisakusen! Does Skylanders not exist in Japan? I was curious about the Wii U version WW because of the DK and Bowser emphasis. Wonder if that means anything for sales. Only the original came out in Japan, and they got an exclusive Wii U version to boot. How did that not even get a digital portal owners' release in the west? It will take time before PS4 SKUs start outselling PS3, even longer before PS3 has irrelevant split at sales and there are specific genres Vita will be untouchable at top. Wait? What happened to Yokai x Sangokushi? Wasn't this game meant to come out 2015? They never gave any date for that game. In fact, we didn't even know the platform until shortly after the conference, via that website. Wonder what is their expectation for the game. Anyone got the splits for Star Ocean 4? Or the opening and LTD of Star Ocean 3? The interesting part is where you compare Star Ocean 4 to Tales of Vesperia which had pretty similar circumstances. Kinda astounding to see the difference in sales for a PS3 upport after being exclusives 360 titles with very similar sales. Yeah, it's done well on COMG but I'm not expecting better sales than your average cheap Bamco cash-in. Isn't that kind of bad for Revelations 2? Or were there other retail releases before? I'd say it's alright for a late-port-but-new-enough-that-people-have-only-just-played-it game of poor quality that was kind of redundant in general. Since people are bound to ask come Wednesday... Due to the Silver week, sales numbers will be delayed this week. Media Create: Friday (September 25th). No time given, so not sure if it's at the usual time (10PM JST) or earlier. We'll most likely get Top 30 right of the gate, but no Top 50. Famitsu: Friday (September 25th). Again, no time given, so it can be at any time on Friday. Dengeki might probably be the superior tracker this week and be the first on thursday at 18:00. SO3 seems to have done well if we count re-releases. SO4 probably dropped in sales because of bad WOM and negative impressions. I sure hope SO5 follows the sales trend of SO3 instead of 4, and I am positive it will be the case as the game looks good so far. Lol at the MonHun Vita tho. Did Koei said something about DOAX3? They made a really good choice with NIOH anyway, I'm sure it'll do well in the west at least. Been thinking about the Ace Attorney anime series, and I wonder which game will benefit from it. Obviously, it's meant to promote AA6, but it most likely will not come out before July (that'd be one year after Dai Gyakuten Saiban, and AA5 had the same announced-to-release time frame). AA1-2-3 or AA5? I'd love if DGS someone benefited from the anime, but I doubt it. My money is one AA1-2-3 (since the anime is apparently based on those games). Maya does have a point. Kids make a large portion of this type of games market and SE need to price the game more accordingly. That PS4 version price tag especially is just too much. Been thinking about the Ace Attorney anime series, and I wonder which game will benefit from it. Obviously, it's meant to promote AA6, but it most likely will not come out before July (that'd be one year after Dai Gyakuten Saiban, and AA5 had the same announced-to-release time frame).. The anime's already been confirmed for April 2016. Edit: Oh, sorry, you were talking about AA6. I dunno, I think it's pretty directly tied to the promotion of AA6, especially since that game is looking like it's going back to certain roots of the franchise. Budget release of the trilogy by then. Generally this kind of thing is about raising the popularity of a brand in general. While there are exceptions, usually transmedia efforts aren't about a particular product so much as an overall franchise. This is why you see 8000 incarnations of Batman across everything imaginable. The idea is to make sure there's at least a variety of products containing Batman that appeal to any particular person and help encourage them to buy more Batman goods. Specifically toward your question though, I imagine it'd have some impact on getting people to try old entries, though many of those who do will buy used games at this point or borrow it from someone they know. It may raise the sales of the next entry if they attract people who were highly engaged by the anime, wanted more, and aren't satisfied to just wait until used copies show up (or just continue watching more anime seasons). Good point about used sales, which are bound to be important for a game like AA. And I agree, the anime is there for the whole brand, but that's a long-term objective, I was thinking of really short-term impact on sales. Oh yeah, I know it's meant to help AA6 (though I wonder how long it will be... if it's just 1-cour, then it will most likely be over by the time AA6 comes out). Was talking of the weeks preceding the launch of AA6. Anyway, just read something interesting on ANN. Fuji TV basically confirmed the Monster Hunter Stories anime would air during the day (6AM to 7PM). In other words, it will not be a late-night anime like most game-based anime. First time in almost 10 years they're creating such a timeslot apparently (last one was One Piece in 2006). Not surprising at all though, since Capcom has made it pretty clear MHS is aimed at kids. Will most likely end up during the week, at 6.30PM or 7PM like Pokémon. I wonder which studio they went with... I believe Pierrot did the Gaist Crusher anime. OLM (Pokémon, Yo-kai Watch) is possible. So this one was a bit different than normal in that it basically referred to both traditional DLC along with both full game downloads and microtransactions when you actually dug into what they were talking about. That said, they've overwhelmingly switched to games that have extra downloadable content, microtransactions, or are simply downloadable games up front. Monster Hunter on 3DS in the main exception. 2.) 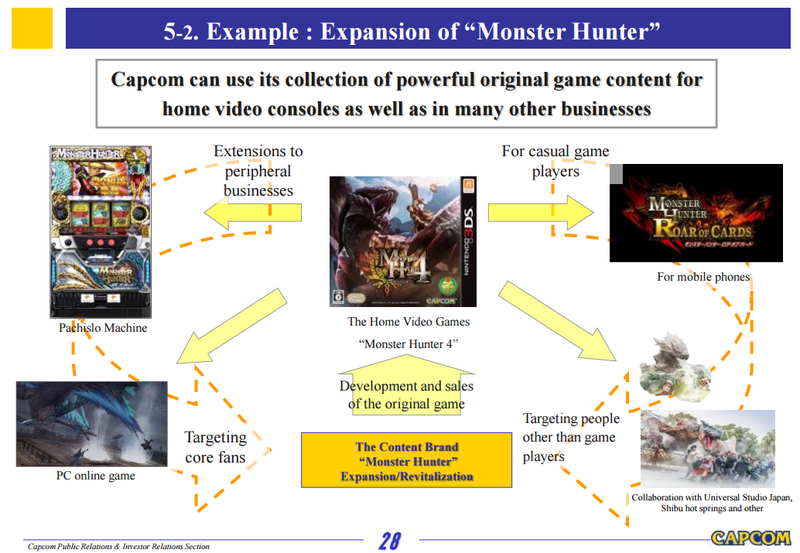 "Upgrade quality and accumulate know-how by developing more titles internally"
Quality is subjective, but they have moved significantly more of their development in house, and with the exception of Capcom Vancouver still existing, they develop almost everything in Japan as well. 3.) "Realign the lineup of titles"
They realigned most of them out the window, and the remaining ones sure do look a lot different than they used to. 1.) "Reinforce marketing activities and measure to monetize these games"
Well, they seem to actually put out pretty frequent marketing materials for their online games these days, and they seem to get a lot of downloads. Hard for me to say how this compares exactly since I don't live in Japan nor a view of their internal marketing metrics. I'll give them the benefit of the doubt. 2.) "Realign the lineup of titles"
They threw out the vast majority of their outsourced efforts and these days Capcom Online Games seems to make up half the company, including helming many of their major projects, which have since been turned from traditional consumer products into online service games. I believe mobile also falls into this category where they've refocused on a selective, but high investment suite of internally developed titles. 3.) 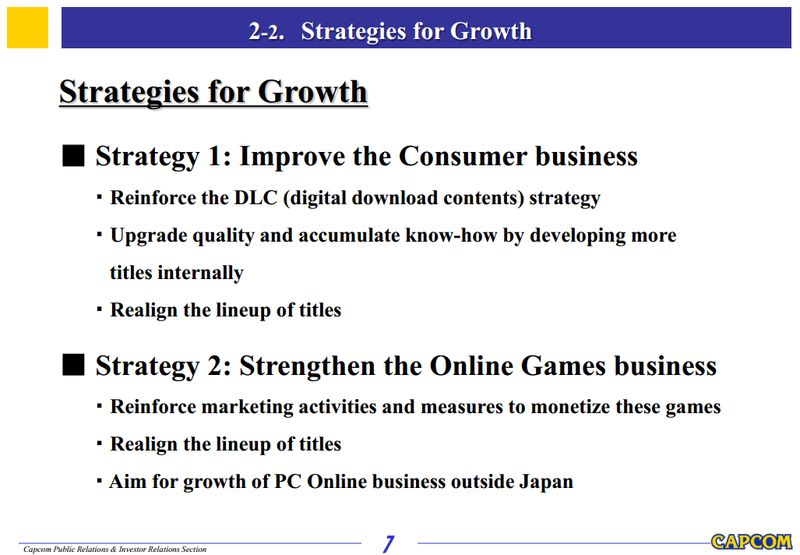 "Aim for growth of the PC Online business outside Japan"
Well, they said "aim", not "achieve", so efforts like Monster Hunter Online and their various Korean and South-East Asian arms are undeniably part of this effort. Yep, we're talking about it right now. Since the Tokyo Game Show MonHun Event, pre-orders for Monster Hunter Cross are growing very fast. Before that, there were very few pre-orders from usual users. They were mainly from new players of the series. 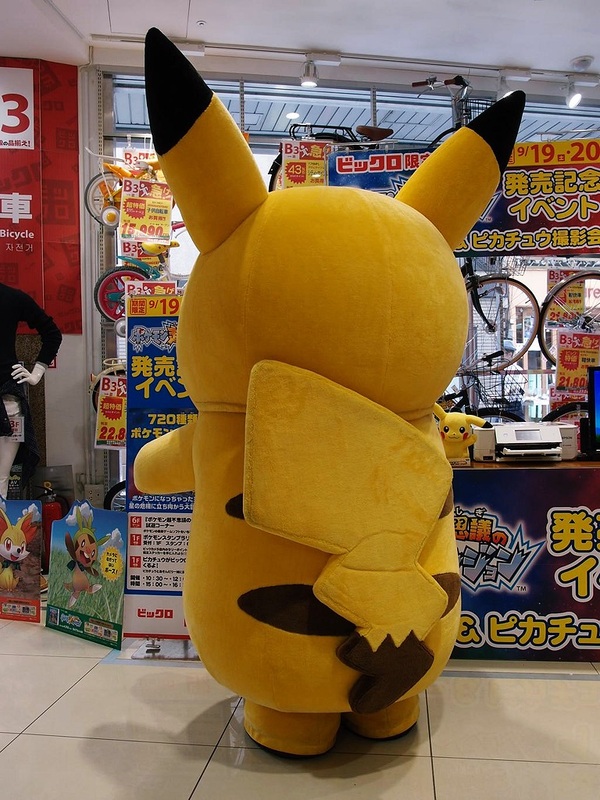 But after the event, the usual users are hurrying to pre-order the game. Good feeling. There're also a lot of guests coming from diferent prefectures since we're in Silver Week. The shop is busy. P.D: Remember that Maya said than pre-orders were lower than MH4U, it will be interesting where they go from now. I imagine a lot of people getting hands on with the new combat system helped as well. It seems like a very significant change that could make a lot of people who were like "You know, I've had enough of the way this currently is." be interested again. Maya girl... that's exactly want Capcom wants. Well, they want that, but not at the expense of losing their entire old audience. Gaist Crusher had an anime? IP bombed even harder than I'd imagined. Yes, it was very much their full attempt to pull a Level 5 the same way Square Enix (Gyrozetter) and Sega (Hero Bank) were at around the same time. It was a major disappointment for them. Monster Hunter Stories is their second attempt at making a children's property. I'm leaving off Mega Man here since while yes, it turned into a children's property, it wasn't always sold like that. I showed my friend the Maya report from SE on the DQBuilders pricing, and she laughed at it. She'll be buying it on Vita. I think the idea SE has with DQBuilders pricing is that "kids will buy it on Vita, so we'll make it cheap" and that then "core fans in their 20-30s will buy it on console, so we'll see better return per sale for a smaller base". But, then, I wonder just how many of the expected (by their own estimates) late-20 to 30 year olds are going to be that interested in Minecraft, especially at that hefty price. Or, additionally, how many kids will even buy it or be able to buy it at that steep price point (for kids). It seems like a very ill-planned... plan. From what I've heard, good word of mouth has started to spread from the hands-on experience since it puts a good, new spin on the series rather than being more of MH3G/MH4/MH4G (which, aside from mounting and swimming, have been following pretty similar paths and mechanics). So a lot of lapsed fans are potentially curious/intersted again, I know my friend has now gone from not being interested to thinking about pre-ordering as she'd gotten pretty bored of the franchise. Though she's actually more interested in Stories. Also I think a lot of people may now not be expecting a G version or, at least, not for the 3DS. The series is in a good position for Capcom with development being so streamlined for the 3DS that I imagine puts them in a good position to make MHX a good experiment without having to sink years of time and money into it for expansion opportunity like MH:Stories (which is a much bigger change than MH4G to MHX, so its would be expected to take time. And the target audience is very different). I'd imagine Nintendo, wanting to keep the series mainline and large spin-offs to themselves, is probably also going to put a push of some sort behind MHX when it hits retail later this year. Potentially, as I see it, a small price drop in the 3DS may not be unreasonable or unrealistic. The usual fans were going to get the game sooner or later anyway. It was a major disappointment for them. Monster Hunter Stories is their second attempt at making a children's property again. I wouldn't say that. I think the goal with Monster Hunter Stories is to get kids interested in the Monster Hunter franchise. is probably also going to put a push of some sort behind MHX when it hits retail later this year. I'm not sure they even need to. There's nothing else remotely comparable size-wise releasing this Fall. Likely, though I imagine Capcom and their partners are sensitive to issues like that considering how many series have imploded on them. I don't think these are necessarily different goals. 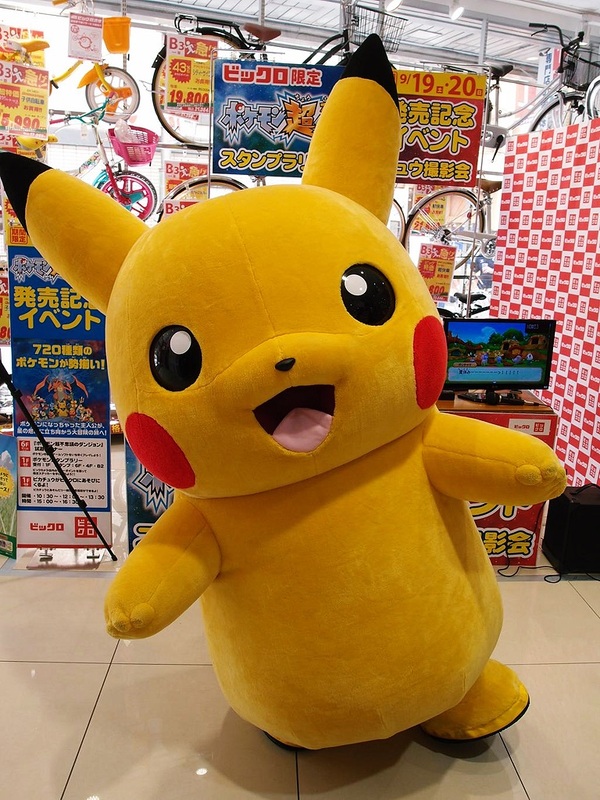 A series heavily targeting children is both a play into building a successful children's franchise and also the start of onboarding new customers into a series they want them to keep playing as they get older. Similarly if you look at World of Final Fantasy, the idea is the make something that will appeal more to younger children, and then they want to continue selling them Final Fantasy titles as they get older. This is something that has been done quite well in the West historically. Just look at Batman, ranging from children's cartoons to teenage cartoons to M rated video games and hard PG-13 Batman films for a model that's been really successful. Each of these feeds into each other of course, so it's not a children's only brand, but it does contain a really successful children's brand as part of its identity. Capcom plans to launch "Monster Hunter Stories" in 2016 for the Nintendo 3DS system. While incorporating the same worldview as other titles in the game series, the new title will feature a new main character called "Monster Rider" who forms bonds with monsters and lives with them. In addition, players will be able to choose a young boy or girl as the main character. Capcom is now working on these and other features that will make the "Monster Hunter" series appealing to an even broader range of age segments. The animated TV program, tentatively called "Monster Hunter Stories", is scheduled to debut in 2016 on the Fuji Television Network and other broadcasting networks. This will be the first animated version of "Monster Hunter". Together with Fuji Television Network, a company that has produced numerous family themed animated programs and programs featured from comic books for the young that have become very popular in Japan, Capcom plans to use the "Monster Hunter" series to create a new animated adventure and entertainment program that people of all ages can enjoy. Hiska's spoilered Vita comment on MHX preorders blew up esuteru. 2300+ reply thread, lol.